With all the attention we like to give finding the perfect engagement ring, it's easy to forget about the wedding band. While choosing your wedding band might seem easy, the task gets tougher when you have a less conventional engagement ring. Even finding a wedding band for classic pear-shaped engagement rings can be difficult. 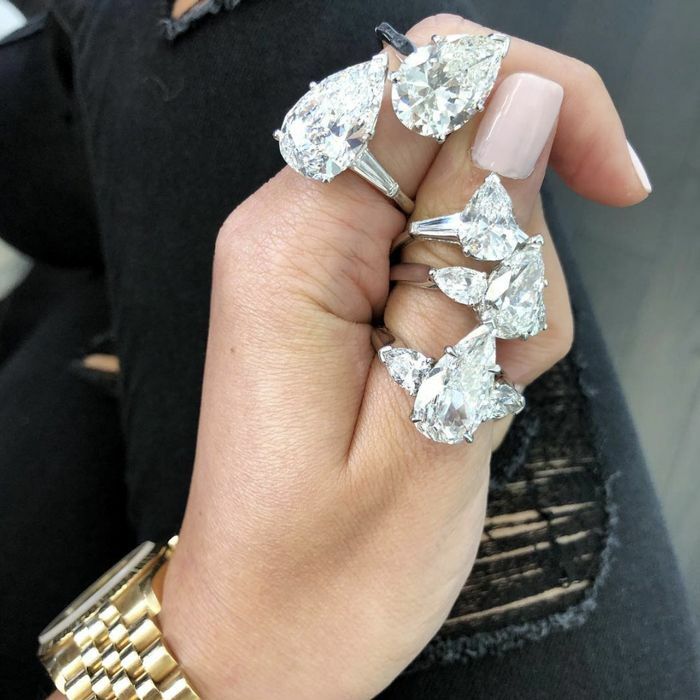 Which is why we tapped Olivia Landau, founder and CEO of The Clear Cut and all-around diamond expert, for her insight on finding the best band to fit against your pear-shaped diamond. "When shopping for your wedding band, the shape of your center stone on your engagement ring is less important than the actual setting of your engagement ring," she says. According to Landau, once you know your setting, you'll be able to find the right band to complement your ring. If your stone is set in a solitaire setting or in a delicate pavé diamond band, you can choose something as simple as a matching band or perhaps even a curved one. If your setting is more complicated, there are more things to consider. "If your pear-shaped diamond is set in a three-stone ring with side stones, you may have a bit of space between your engagement ring and your wedding band," she explains. "Because of this, you may want to consider an understated band as to not take away from your engagement ring." Landau also adds that one thing you should avoid when searching for a wedding band to wear with your pear-shaped engagement ring is mixing faceting patterns on the same finger: "I wouldn't recommend getting a larger emerald-cut eternity band if you wanted to wear it on the same finger as your brilliant-cut pear-shaped engagement ring. The difference in the patterns can create a confused look." With that advice on hand, scroll down to shop rings that'll go perfectly with your pear-shaped engagement ring. You'll never want to take this band off. Subtle while also making a statement. Black diamonds are so unexpected. If you like texture, you'll love this braided band. Whether your pear stone is sitting in the traditional way or east-west, this band will fit your engagement ring nicely. This is simple with the right amount of sparkle. We can't get over the subtle texture of the band. This band is ideal for everyday wear. Create the look of a ring stack with this pavé ring. This will look so good worn with your engagement ring or on its own. This will nestle well with your ring. Made for the no-fuss bride. Create a unique cluster with an additional pear-shaped diamond. An eternity band is always classic. You'll never get tired of looking at this. When in doubt, you can never go wrong with a minimalistic band. 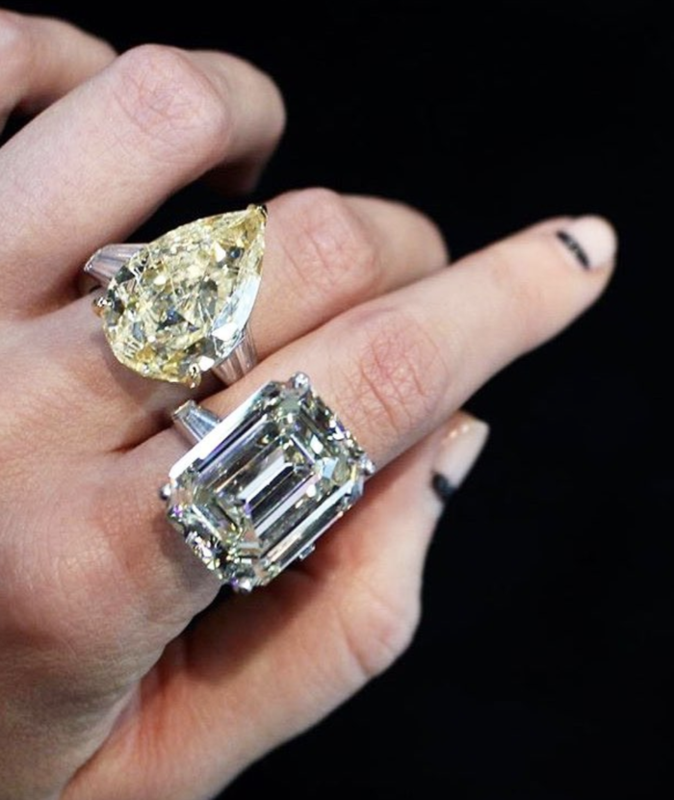 Next, the popular engagement ring style celebrities are still loving.